Artist John Coleman overcame many obstacles to pursue a career in fine art and in the process has become one of today's most highly regarded Western sculptors. During the mid-1980s I was invited by my friend Steve Rose of Biltmore Galleries to join a group of approximately 100 prominent businessmen, including judges, attorneys, doctors, astronauts, artists and art enthusiasts, in the formation of the "Charlie Russell Riders," a gentleman's ride. The entire group would meet at various ranches throughout Montana for a week of trail riding, fishing, prevaricating, drinking, and gourmet food. In the late 1980s, our ride was at the Mountain Sky Guest Ranch in Emigrant, Montana. We were assigned our cabins, which were shared by four riders. The mornings were extremely cold and the only heat was a wood-burning stove. We agreed to take turns getting up at 5 a.m. to build a fire so that we could at least melt the ice that formed on the container of water we placed on the stove the night before to share first thing in the morning. The first morning was a disaster; the fire went out. The second day was my turn; I was determined to build the best fire ever. I gathered plenty of small kindling and ample paper for my first attempt at starting a fire in a stove. I was up at 4 a.m. and carefully arranged the paper and kindling under as many logs as I could stuff into the fire box, lit the paper and got back into bed. I laid there waiting until the 7 a.m. wake-up, waiting patiently for the roar of the stove. I had stoked so much wood in the fire box that it was well after breakfast before the fire began to burn with a vengeance. George Montgomery - Western movie actor, outdoorsman, lover of all the beautiful women in Hollywood, sculptor and furniture builder - was to be the last to start the fire, and he informed the three of us we didn't have a clue how to build a proper fire and took it upon himself to be captain of the stove. Each morning he rolled out of bed at 5 a.m. in his red long johns and showed us how to build a proper fire. We stayed in our warm beds and proclaimed what a masterful job he did. After my pre-boasting about what had become an inept failure in attempting to excel in stoking a potbellied stove with little knowledge or instruction, I found this difficult to live down for the remainder of the week. The story was shared among the entire camp. Steve Rose held court and fined me $100 for pain and suffering of my bunk buddies. I have taken this opportunity to share my inept failure in fire building with you as a simplistic analogy to the desire and determination of a challenged youngster attempting to conform and be in harmony with his surroundings. John Coleman has been afflicted through his lifetime with serious dyslexia and attention deficit. These challenges remained undiagnosed throughout his childhood, and he had difficulty concentrating, finding reading and writing extremely difficult. His teachers placed him in the rear of the class, considering him slow or mentally challenged. Although very interested in history and responsive to visual presentations, he was content to remain in the back of the class and draw images with pencil and paper. He had a unique gift in his artistic ability; his determination to excel in art provided a release that brought him recognition and self-assurance. He discovered he had the ability to see things differently and learned to channel his emotions and communicate through his art. John was born and raised In Manhattan Beach, California, the second of three sons to Mark and Jean Coleman. When entering junior high school his parents were asked to engage a child physiologist for evaluation as John had been evaluated by his teachers as an "underachiever." Unfortunately dyslexia and attention deficit had not been recognized in the 1950s and early 1960s. The visual and oral examination left his disabilities undiagnosed. John continued to fall behind the other students, and as a sophomore in high school, his counselor advised him there was no way he could graduate. This became a personal challenge. John took as many art classes as he could, he excelled in his physical education courses, his interest in history became a priority, and he had developed an exceptional ability to absorb lectures. John, although somewhat of a rebel, was socially active with his classmates, especially the girls. John had become infatuated with Sue Podczerviensky, a very attractive young lady in his history class. Sue was aware of John's learning difficulties and made a concerted effort to help him with his reading assignments, and often he would achieve a higher test score than Sue. John continued to excel in his art classes, and his high school art instructor became his mentor. He convinced John to enter one of his drawings in a contest that resulted in a summer scholarship to the Art Center of Design in Los Angeles, which lead to an offer to illustrate a syndicated column for a national newspaper. John would provide portraits of various stars for a gossip column written by a celebrity hairstylist. At age 16, he was being recognized as more than the challenged young man sitting in the rear of the class. Despite his efforts, John failed to graduate from high school. His father passed away when John was 17, and this was a difficult time. He made the decision to evaluate his alternatives. John has a vibrant personality, a great sense of humor, is creative, and enjoys working with his hands. He applied for a position at General Motors where he gained employment. He freelanced, providing technical illustrations in his spare time. John was frugal with his earnings, astute in his investments, and after John's 19* birthday, convinced he was financially capable of supporting a family, John proposed to Sue, who he had been infatuated with since junior high. Sue had recently graduated from high school and was working as a secretary. She accepted his proposal and they were married. Within the next year Sue and John moved to Parker, Arizona, a recreational area located on the Colorado River. His mother had become a successful real estate agent in Parker and it wasn't long until John had met many of the established local residents. Sue and John were blessed with their first of two daughters, Heather, when John was 20 and Sue was 19. John was extremely industrious, willing to work long hours and he possessed natural business applicability. He installed awnings for mobile homes and established a contracting business, building decks and screen rooms. He was driven, competitive and within a short period of time began developing commercial properties in Prescott Valley, a promising area within an easy driving distance. Sue and John moved to Prescott on New Year's Eve 1972, shortly after the birth of their second daughter, Hilary. Prescott was an area full of history, an established art community, and they soon became friends with many of the local artists, which encouraged John's interest in his art. The Colemans purchased an 11-acre run-down mobile home park, moved off the existing tenants, expanded and upgraded the site, installed new paved roads, sewer and water lines, landscaping and full hook-up facilities for each individual location. They required all permanent residents to install a carport, deck area, skirting and an enclosed storage area, assuring them additional income. A vacant area next door became a gas station and a car wash. Several acres behind the gas station was developed into the first mini-storage facility in the area; which in a short period of time was fully rented. A Days Inn motel was construted on the property, something which was needed in the community for several years. Although extremely busy, John continued his interest in art. He found solitude in his art, a way to shut off the daily stress. This was his personal escape. Sue and John's daughters provided them with six wonderful grandchildren, who have become their pride and joy. Left: Lives with Honor, charcoal, 20" x 20". The artist says, "This exemplifies the simple idea that to grow old with integrity, wisdom and status among one's people was key. This elder has many symbols that tell his story of an honored life." Gold Medal in Drawing at 2009 CAA show. John had previously been introduced to an art gallery owner from Sedona, Arizona, and his drawings and paintings had been brought to her attention through a mutual friend. After viewing the works in his home and small studio, the gallery owner invited John to let her represent his work. With encouragement from Sue, he reluctantly agreed. This became the initiation into what would become a new career. John had become extremely successful, and they had contemplated retirement for some time, however dismissed the idea as John was concerned that after traveling and adjusting to the relaxed lifestyle of retirement he would become restless. As the demand for his artwork evolved and began to require more of his time, together Sue and John made the decision to seriously consider his lifelong interest in art as a challenge, a new adventure in a new career. John had long been attracted to sculpture and had recently been inspired through a television presentation by an artist creating wall hung relief sculpture, similar to his portrait and figurative work. The concept of this third dimension of the perception of depth would be an interesting new challenge. John found that sculpting came naturally, and after several initial preparatory drawings he was able to mentally visualize the image as it progressed. After being pleased with the results of his first few attempts, he made the decision to produce a complete sculpture, creating an image that could be viewed from all sides. This could be a rewarding experience, and pleased with his some initial smaller images, he was anxious to progress into a larger more important work. 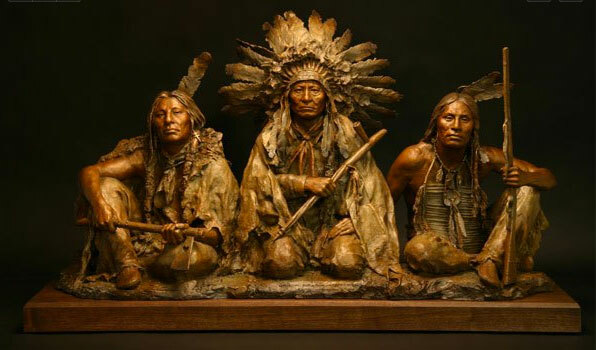 Although much of his previous sculpting had involved the female form, John had always been drawn to the history of the West, and the American Plains Indians of the 1800s was of major interest. Watching some of the great Western movies flooded his imagination with subject matter - historical and mythical - and the visions of these images so influenced him that the American Indian subject became his motivator. John felt compelled to communicate this passion to others through his art. He had sculpted several smaller works of Indian subjects that were encouraging and he found sculpting was stimulating and exciting. John Coleman, CA, Man's Prelude to Honor, bronze. The artist says, "In preparation for the morning ride, a Sioux warrior adorns himself with the symbols of his past glories. He wears his personal medicine for power and with ceremonial lance and shield, he dances for war. To acquire a greater understanding and the expertise to work in bronze, John enrolled in classes at the Scottsdale Artists' School. His instructors were working artists that he highly respected. As John acquired confidence in his abilities he became determined to challenge himself to produce a major work: a half life-size action figure. Posing a live model provided several alternatives; his substantial background of working with the human figure from life and understanding perspective and form was a major asset. 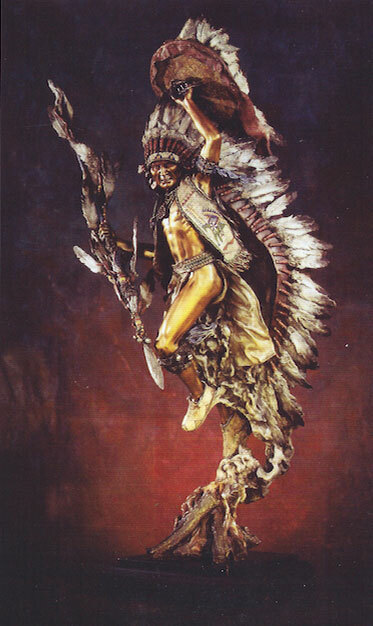 He visualized a single Plains Indian figure performing a war dance, and with Sue's help, they researched the war dance ceremonials, proper costumes and artifacts. He took numerous photographs of a live model, drew several images from various angles, and sculpted two or three small studies. He had a difficult time resisting the temptation to just jump in and start the project, but recognized the importance of eliminating preliminary errors and developing a design and composition that could be fully appreciated from all sides. From the preliminary drawings, studies and mental visualization, he had already determined the title, Man's Prelude to Honor, when finally he decided on the attitude of the form. John constructed a substantial armature and began to apply the sculpting clay. His attention remained focused on his original visual concept and alternative ideas surfaced, keeping him alert and stimulated. Modification of facial expressions, artifacts, creation of areas to capture lightt and shadows to influence detail became part of the finished clay image. After several weeks of developing the image, John spent a number of days tediously modifying the final clay image until he was satisfied. Man's Prelude to Honor was his first major bronze. Comments from foundry workers and friends were positive, and John and Sue were delighted. This had been a significant effort, with John putting his heart and soul into this work, and the foundry workers had sensed his dedication and each made a concerted effort to assure the process of forming the molds and casting procedures were impeccable. Man's Prelude to Honor would be an important step forward in the career of John Coleman, the artist. Upon the initial exposure of Man's Prelude to Honor to the art community, a collector from San Francisco called and purchased the bronze for $18,000, which was certainly the largest sale in John's fledgling art career. Approaching 50, the decision to achieve John's lifelong ambition of establishing a career in fine art was coming to fruition. Sue and John made the decision to sell off all the businesses and properties to eliminate distractions. The sizable nest egg that they had acquired would provide them with security and freedom. The initial exposure from Man's Prelude to Honor opened the door to his acceptance into the prominent Troy's Cowboy Art Gallery, located on Main Street, in Scottsdale, Arizona, and then a year later with Tony Altermann Galleries, then located in Dallas, Texas. In 1993, Howard Alper, a collector from Chicago, became John's first benefactor. After visiting the Colemans and discussing John's work, Howard made the commitment to purchase the number one casting of each of his future sculptures, which has continued through the present. As John's expertise in working in bronze and his self-confidence matured, his sculpting technique became refined and his work more professional and identifiable. John was communicating his passion and developing the ability to infuse life into his sculpture. I have followed the progress of John Coleman since shortly after his representation by my friend Tony Altermann. It was obvious he was highly committed to his art; there was an abundance of natural talent. I had formed the opinion John was unconsciously emulating several prominent artists of which he admired, but they were influencing him, restricting his ability to establish his own identity. To the best of my recollection, it was in late 2000, and I was absolutely mesmerized by a work of John's titled Taos Trade, a simple 21-inch high image of a young barefoot Indian girl. The facial expression, the suggested detail of the hands and feet, and the natural flow of the blanket or material wrapped around her head and body, it was a magnificent simplistic composition. It was solid, strong and possessed magnificent form. It was obvious John had found himself. His natural talent and ability to communicate to the viewer was overwhelming. I began to observe a progressive step forward in his work, always totally committed, a driven work ethic and an unquenchable desire for knowledge. He began to develop surface textures, suggesting detail in almost an impressionistic style, introducing simplistic abstract shapes that invited the viewer to become engaged in the work. One of John's favorite quotes is from the movie The Agony and the Ecstasy, when the Pope looks up at Michelangelo's creation of man and states "...so that is what God looks like." John believes putting a physical face on a spiritual idea has been the endeavor of artists from the beginning. In 1999, John was inducted into the National Sculpture Society, where he is a fellow member. 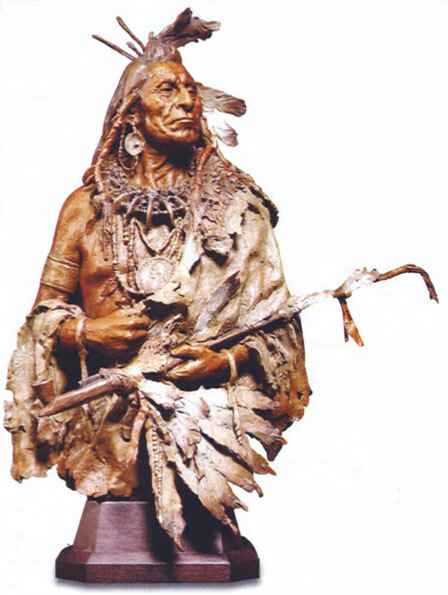 In 2001, John was invited into the prestigious Cowboy Artists of America, an outstanding group of artists, painting and sculpting in the Western genre. This, in John's opinion, was the consummate achievement. At age 53, only nine years after starting this new career in fine art, he was being seriously recognized as one of America's great contemporary sculptors. He grew a larger mustache, purchased a new Stetson, cowboy boots, and proudly wearing his Cowboy Artists of America belt buckle, became one of the CAA "good ol' boys." Shortly following his acceptance into the CAA organization, I observed a decisive change in John's personality, an artistic freedom of expression in his work. During conversation I found the term "artistic ego" would surface; with John Coleman, ego requires clarification and it defines his self-assurance, his confidence. Case in point, when our dear friend Ray Swanson passed away, during the funeral ceremony, John, on behalf of his fellow CAA artists, without hesitation stood before an overflowing crowd and eloquently eulogized his friend and mentor. This past year John served as president of the CAA organization, and during the 2009 CAA Exhibition and Sale, John was presented with the Gold Medal for sculpture, the Kieckhefer Best of Show Award, and the Gold Medal for drawing. In 2002, I was convinced John would bring a new perspective to the Masters of the American West Fine Art Exhibition and Sale. I approached our Masters committee chairman Jay Grodin, we tendered an application on his behalf, and John was unanimously accepted. After a short phone conversation, John agreed to accept our invitation and has become an important part of this preeminent exhibition and sale each year. In 2004 he was invited to present his work at the Prix de West Invitational Art Exhibition and Sale at the National Cowboy & Western Heritage Museum in Oklahoma City, Oklahoma, and in 2009, he was presented with the James Earl Frazer Award for Sculpture and the Nona Jean Husley Buyers' Choice Award. In April 2010, the Gilcrease Museum in Tulsa, Oklahoma, will feature a retrospect of John's work. In late April, John will be teaching a sculpture class at Scottsdale Artists' School to launch the Joe Beeler CAA Foundation mentoring program for emerging artists. Left: The Game of Arrows, bronze, 60.5" x 26" x 16", ed. of 12. Gold Medal for Sculpture and received the Kieckhefer Best of Show Award at the 200 CAA show. 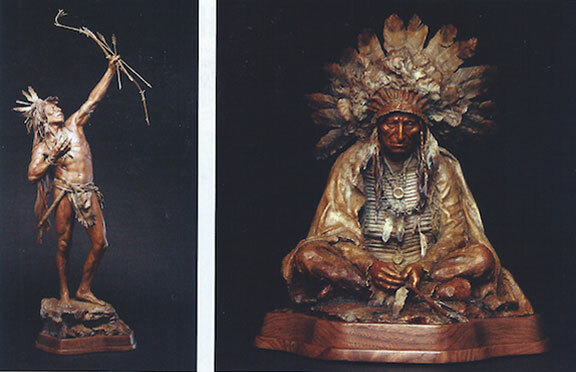 Right: Glories Past, bronze, 19" x 17" x 14", ed. of 35. The artist says, "An old warrior holding a coup stick from the days of his prime reflects on his youth and his many exploits of glories past. I have contemplated the astonishment of John's grade school teachers that had underestimated his capabilities, the delight of his high school art instructor who encouraged him and recognized his remarkable gifts, and I cannot help but feel for the other children with learning disabilities who have not realized their individual potential. 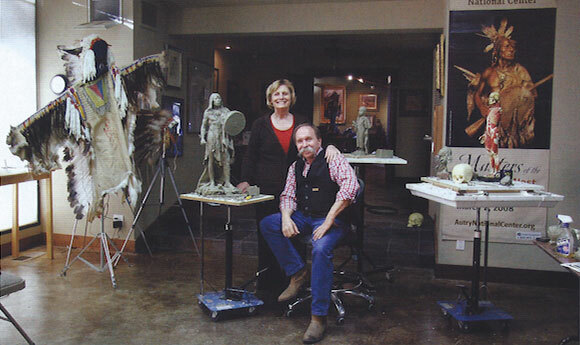 Sue and John continue to live in Prescott, Arizona, and in 2005, they made the decision to develop a studio, showroom and office on a peaceful 2-acre property five miles outside town, a picturesque area abundant in pine trees and wildlife, which is the environment conducive to the process of creating art. The existing building was a sprawling ranch house, which, with required modifications and additions, occupies approximately 5,000 square feet of the property. The central part of the structure is dedicated to a showroom providing visitors, by appointment, the opportunity to view the personal collection of John's sculptures as well as the impressive collection of works by fellow artists that are tastefully exhibited throughout the complex. John's studio contains an impressive collection of artifacts that he uses in his compositions; there is an impressive library of research material in his studio. There is a photo essay of John's property in the October 2009 issue of Western Art Collector. Although John continues to have difficulty reading, his ability has improved considerably and he enjoys researching new ideas and reading historical novels, both fiction and non­ fiction. He finds solace in being surrounded with this information and knowledge, and while John is working, the studio is filled with the whisper of classical music that creates a peaceful atmosphere. Beethoven, Mozart and Rachmaninoff are his favorites. This provides a diverse atmosphere from the disorganized, noisy industrial building where he worked in downtown Prescott. He has leased his former studio location to his close friend, Eric Peterson, who is an accomplished artisan in his own profession. Eric is entrusted with the final chasing of the finished bronze casting and application of the precise patina finishes. Sue's office area in the new complex is well organized. She is his foundation, inspiration and cheerleader. All the scheduling, appointments and paperwork are her responsibility. John is the first to admit without Sue by his side none of their accomplishments would have been possible. In a comparatively short time, together they have made a substantial impact on Western art. It has been my pleasure to have observed this progress and to consider them my friends. John advises all young men and women in beginning their professional careers to "Handle adversity, set personal goals and stay with the plan. All things are possible." 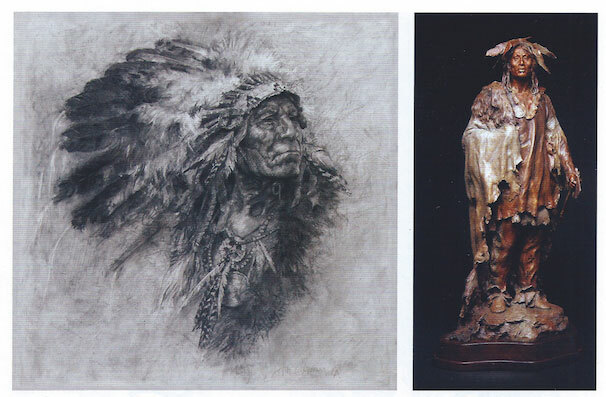 John Coleman is represented by The Legacy Gallery in Scottsdale, Arizona, and Jackson, Wyoming; Medicine Man Gallery in Tucson, Arizona, and Santa Fe, New Mexico; The Plainsmen Gallery in Clearwater, Florida; InSight Gallery in Fredericksburg, Texas; and Borsini-Burr Gallery in Montara, California.